Monday! New theme day! For the next few days, I will be reviewing some great indie comics and graphic novels that I’ve picked up from people that I’ve met over the past year. Let’s kick things off with a cool book that I picked up at RETCon Chicago earlier this month. 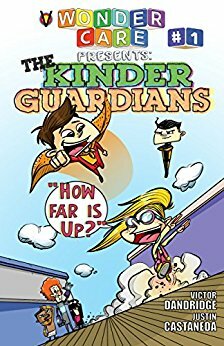 Well, while chatting with Justin, he handed me a copy of The Kinder Guardians, a superhero team of kids at day care, while their hero parents fight crime. The self-published collection comes with a few single issues of The Kinder Guardians, a NCBD (New Comic Book Day) Special, some guest art, and Kinder Guardians comic strips: lots of bang for your buck! This is a great book for kids. Each issue works to teach a valuable lesson about friendship, leadership, family, etc…you know, all the good stuff that kids need. And at the end of each issue, the creators have inserted a question guide with QR code for kids to upload answers to Google Docs. 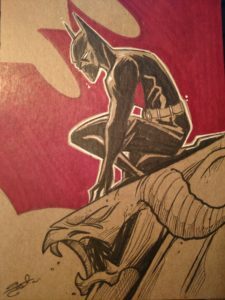 I’ve never seen that in a comic. The interaction element is neat. The art is fun, and with the silly characters and plot lines, kids should eat it up. In my favorite issue, the monster Snewz puts all of the kids to sleep as they fight him to the bitter end, eventually leading all of the kids at the daycare passed out on the floor. Cute, I know. I like this book because it’s not the typical kid hero book from the big companies. I like the big company little kid books too, but there’s something special about backing an original, local book. We need to help independent creators and stories get out there! If you have little ones, I encourage you to check out The Kinder Guardians, and share it with them. It’s an all ages book with Teen Titans Go type action. Check back all week as I shed light on some indie titles that you may dig.